SJ: Even though we’ve never met in person I feel as though I know you through your music. Tell me a little bit about your background, musical or otherwise: where did you grow up, what is your musical chronology, how/when did the dobro enter the scene? 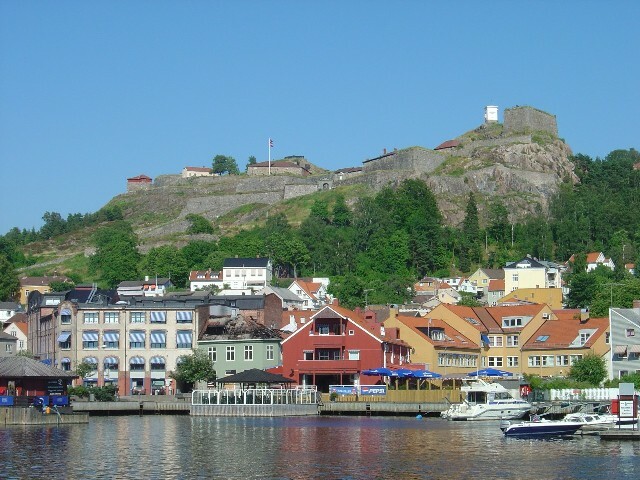 FH: I grew up in a small town in Norway called Halden. I live there still:-) A beautiful place on the border to Sweden, way down south. Population is approx 30000 and there’s a big fortress on top of a hill, looking over the town. I started to play a little bit organ when I was 6 years old, but I didn’t start playing for real until I picked up the guitar at the age of 16. I started playing professionally when I was 18 and it’s been my occupation ever since. I’m mainly selftaught, but I went to Musicians Institute of Technology in Los Angeles for 12 months, to learn theory. I sang and played guitars in various bands up to 2006 when I picked up the dobro. I also started playing banjo, mandolin at that time, but my heart was with the dobro. SJ: What led to your interest in the dobro in the first place? It’s still a relatively obscure instrument here in the states and I am willing to bet it’s even rarer to find someone playing the dobro in Norway. Listening to your music and your videos I get the impression that you came to the instrument with a highly develop ear and learned to play by expressing what you hear inside your head vs. copping licks off of records or watching others. 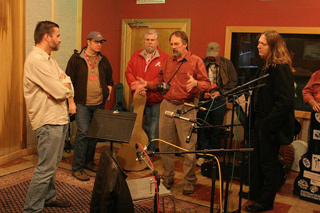 I’m selftaught on the dobro too, but I went to Resosummit in ’08 to learn a few tricks from the masters. I never played or almost even heard bluegrass until ’06. Bluegrass isn’t that well known in Norway. So my approach to the dobro is to play music I’ve listened to and grew up to, and that’s pop/rock. For an example, I have arranged several Beatles tunes on the dobro. SJ: Watching the video clip above just reinforces for me the value of being able to play what’s in your head and the discipline and patience required to translate that onto your instrument. It seems as though non-musicians sometimes assume great musicians are born with this innate talent and don’t have to do much work to get their chops together. FH: Being a singer also, helps you to play any instrument I think. You have to learn melodies in your head, not just your fingers. SJ: Where do you draw your inspiration from when writing new tunes or arranging other’s music? Who or what is your muse? FH: My inspiration is just playing and getting better. I believe in hard work and practice. I’m not that kinda guy who sits around and waits for inspiration. I think writing music is like a muscle. You need to do it all the time to keep it in shape. Of course, some days are thougher than others, but I do get a kick of playing everyday. And I get really cranky if I don’t play.. Maybe it’s an addiction! I just recently picked up the fiddle, which is a really tough instrument to master. I’m fully aware that I will not ever master it, or any instrument, but it’s a good thing to learn different instruments. Because you can incorporate different techniques into your own style at a given instrument. SJ: The quality of your recordings is awesome! Please tell us about your recording gear but also about the process that you’ve gone through in learning how to get good results in the studio. FH: Thanks! My interest for recording began when I started playing and I believe it’s been a really important part of my musical development. I bought my first Fostex 4 track cassette-recorder when I was 17 and went on from there. I’m now using Cubase 6 recording software and have collected microphones for a while. 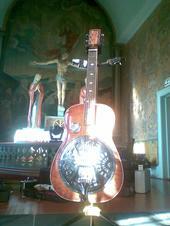 On the dobro I love to use the Neumann KM 184, AKG 414 and Audio Technica 4033. I’ve also discovered that good preamps are a must. I have a Vintage Design DMP ( Neve clone ) and a Chandler Germanium that I like to use on the dobro. But the two most important things you need is a good musician and a good instrument. SJ: Perfect segway! Please tell us about your instruments: what process did you go through in choosing your instruments and what advice do you have for someone who is either just getting started with the dobro or ready to upgrade from a starter instrument to a pro-quality instrument. What does your live rig consist of? Can you share any advice for getting good sound for live performances? FH: I have one Beard Maple E, and one Beard Vintage R model. My first dobro was a crappy Bean Blossom, and I tried the Beard Vintage R model in a shop, and was sold on it right away. Then when I visited Nashville first time in ’07, I tried the E model at Gruhns. Of course I had to have that one too. hehe I feel that I have two very good dobros that represent two different sounds. E Model is more “modern”, and the Vintage R sounds more old school. I found out fast that a good instrument makes you want to play and practice more..
SJ: Speaking of live performances, I heard that you joined Tim O’Brien on some gigs last year: how did that come about? I’d also be interested to hear more about the music scene in your area and what kind of gigs you do on a regular basis. 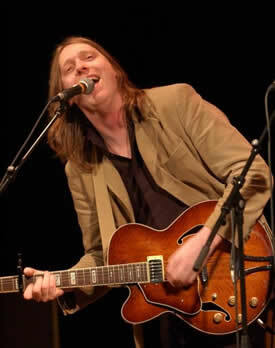 FH: Yeah I played with Tim for three gigs here in Norway.He’s such a great songwriter and musician. I first met Tim at a recording session in Nashville. And he told me that he always wanted to come to Norway and play. So when I got home I picked up the phone and called a couple of places. And we had fun for a week. I played the dobro, guitar and mandolin on those gigs. SJ: Thanks so much for taking the time to visit with us! What kind of advice do you have for someone who is just getting started on the dobro and/or the music business? Any words of wisdom? FH: Give it your very best and don’t quit! Be curious on different styles of music and willing to learn. Although the dobro is known as a bluegrass instrument, it doesn’t have to be limited to just that. Thanks so much for having me!